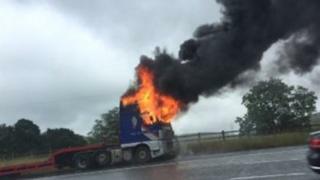 Delays were caused on the A74 (M) in South Lanarkshire after a lorry caught fire. The incident happened between junction 14 and 15 northbound at Crawford at about 09:30. The Scottish Fire and Rescue Service attended and extinguished the blaze.